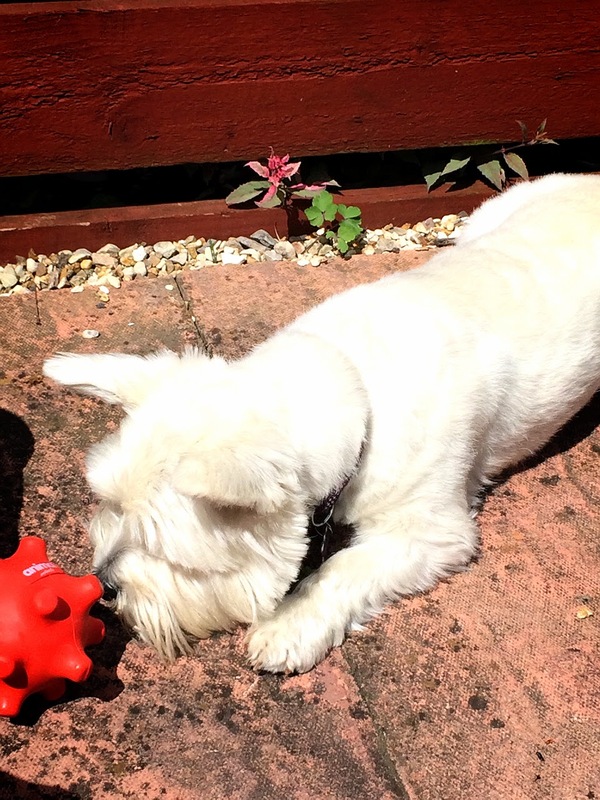 Thursday Barks And Bytes - Mum's Home and I have a new treat ball can life get any better? Today is my first day at home after my hospital stay from the operation. To be completely honest it doesn't feel as good as expected. Things are so much harder at home, with not being able to weight bear or bend my knee. Every small little task is like climbing mount Everest. Luckily though I only have this plaster cast on for four weeks so things can only get better. 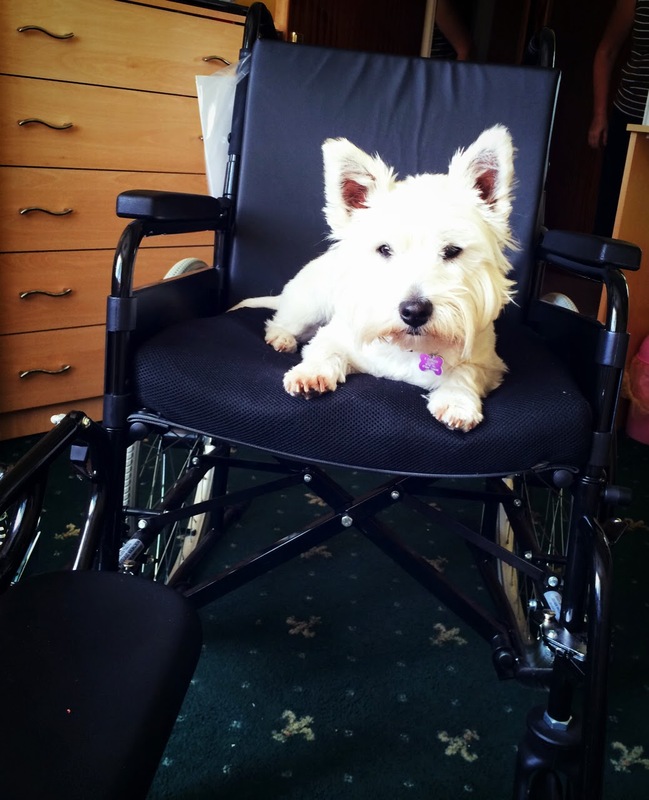 The hospital has loaned me a wheelchair with a leg rest so I could mobilise around the house. Of course Lottie needed to give it the royal approval and as you can see I think it passed! 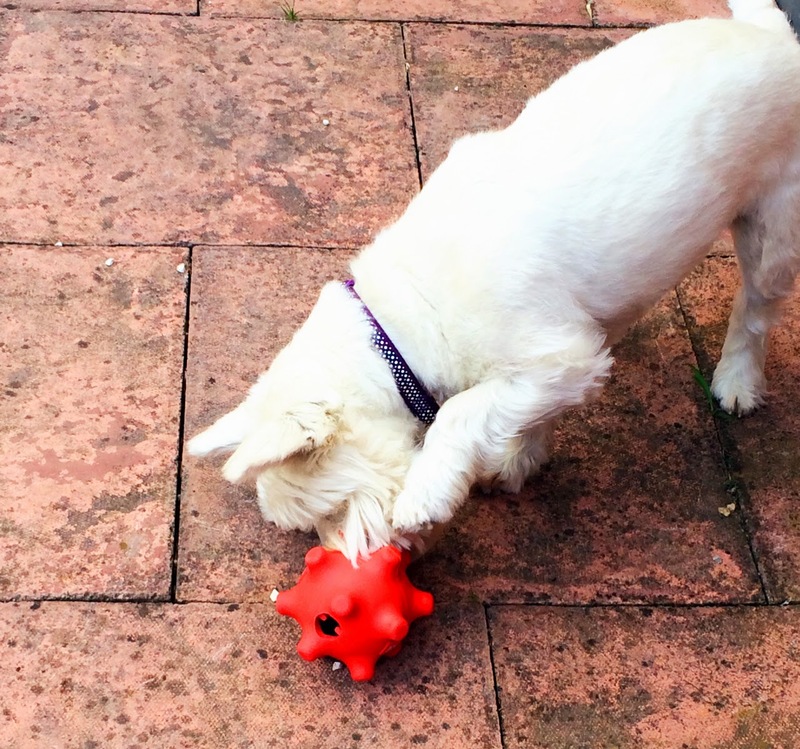 Before I went into hospital I decided to treat Lottie to a new toy. (As a sort of mum being away present). 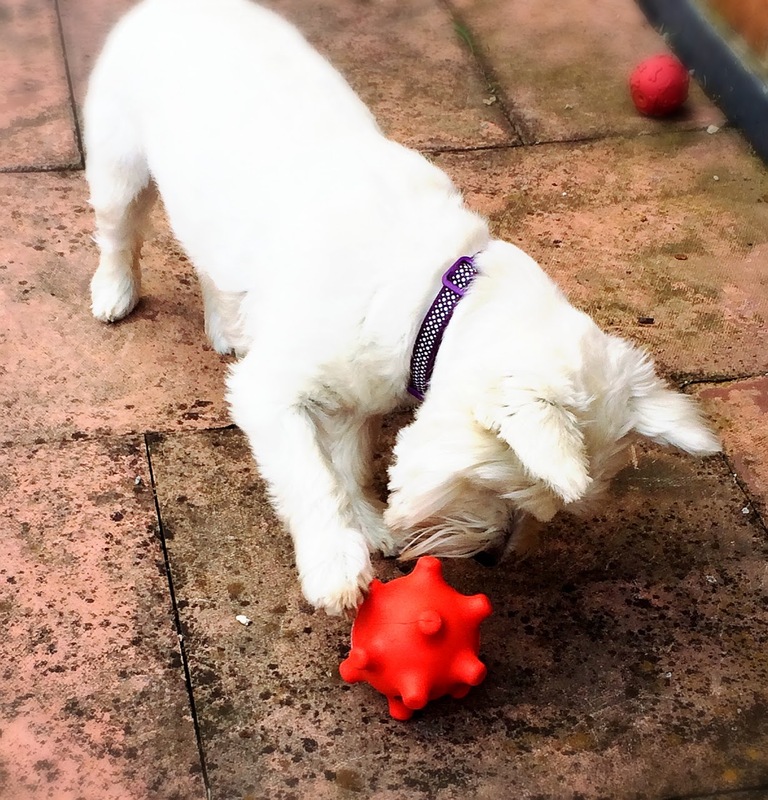 Lottie has tried and tested many treat dispensing toys some of which we have been more impressed with than others. The idea of the three designs is they progress in difficulty levels. 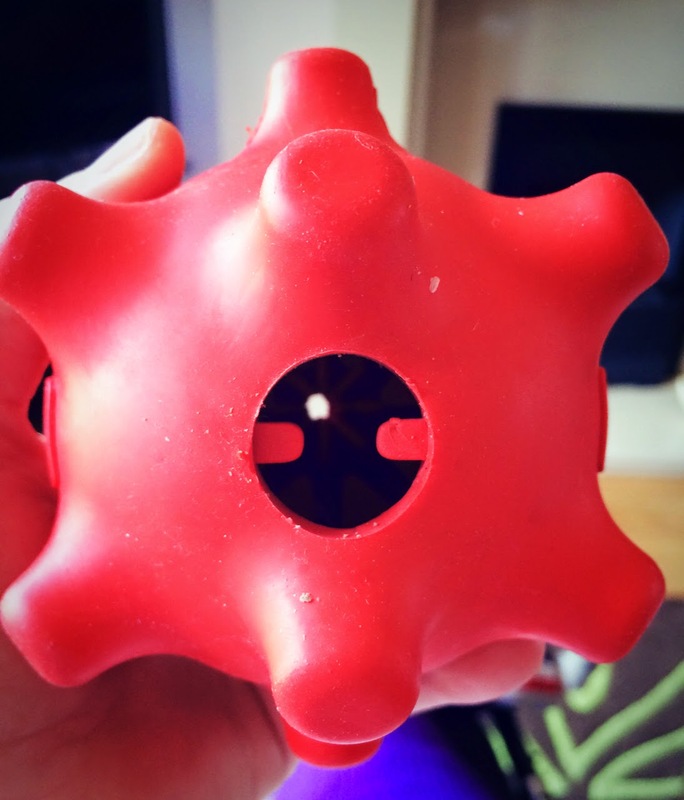 The ball is the easiest and due to its shapes and also having the largest hole treats fall out easier. The pod is stated as medium difficultly and has a 4" exit hole. The atom is leveled as the hardest of the three, this was my main motive for purchasing as we have found many treat dispensing toys in the past are far to easy for Lottie and within five minutes she has finished. 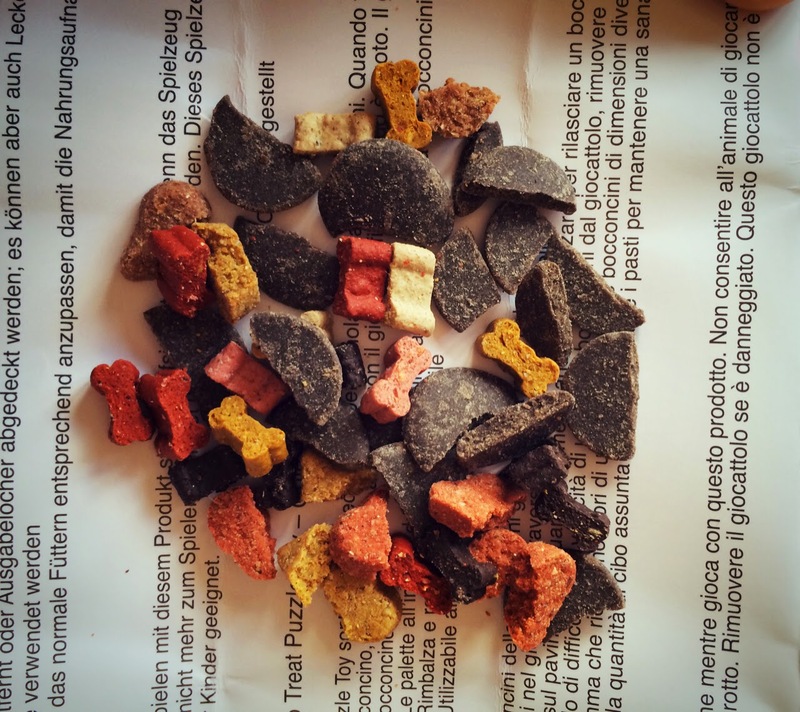 Each toy has removable tabs on the exit holes which can be removed to increase the flow of treats or left to increase difficulty. I decided to leave it standard and see how Lottie got on. 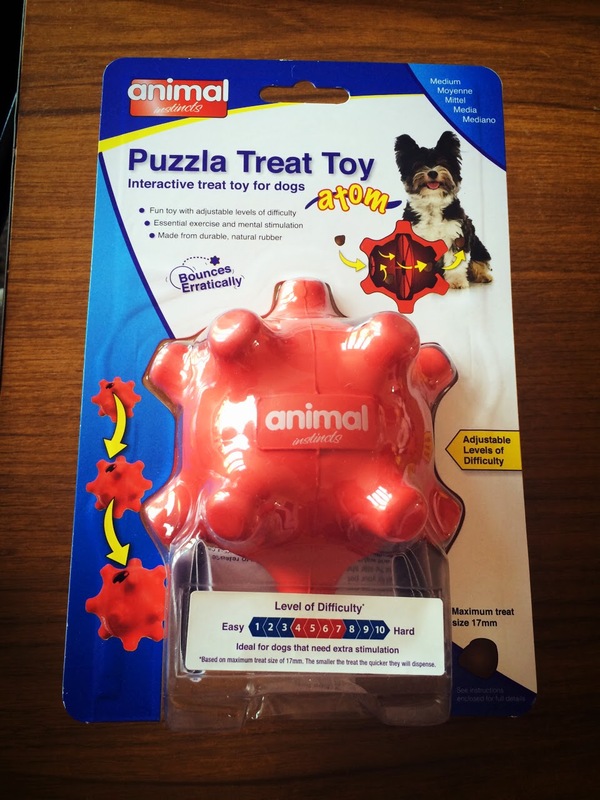 Inside the atom toy there is also rubber triangular pieces which stop the treats from being dispensed too quickly. As you can see I didn't fill the toy with many treats and only used small ones to start with. Lottie couldn't wait to get started. As soon as I gave her the toy I saw the instincts she shows when she really likes a new toy. The toy lasted her around 20 minutes which I was really impressed with seen as the amount of treats I used. The treats were difficult for her to get out but because I used some of her favorites this gave her the motivation to keep going. Finally I have found all the important factors that I want from a treat toy. 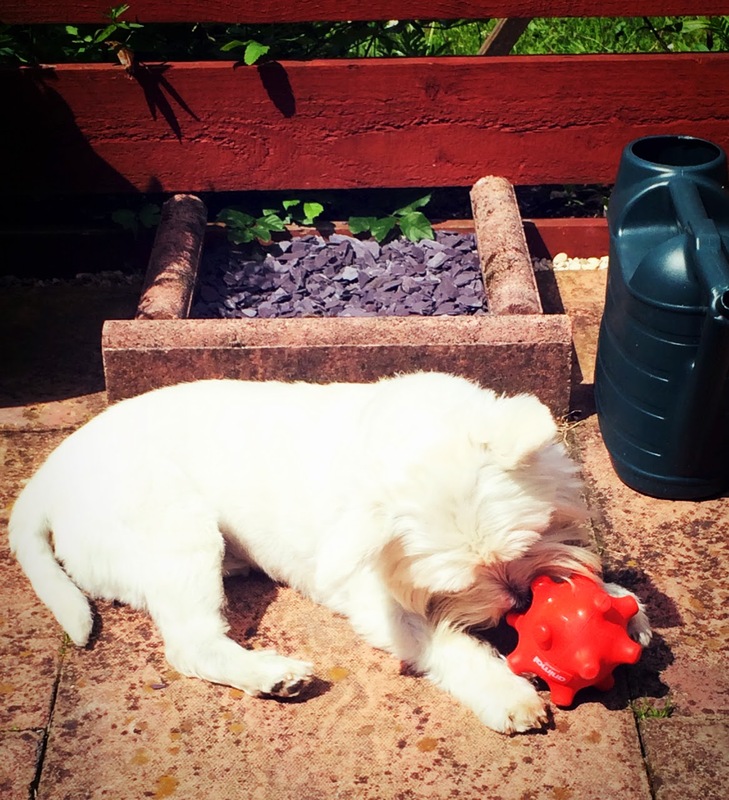 A durable, well designed well priced treat dispensing toy. The main reason I am highly impressed is Lottie actually found the toy challenging which is exactly what I wanted. I am a big believer that mental exercise is equally as important as physical exercise. 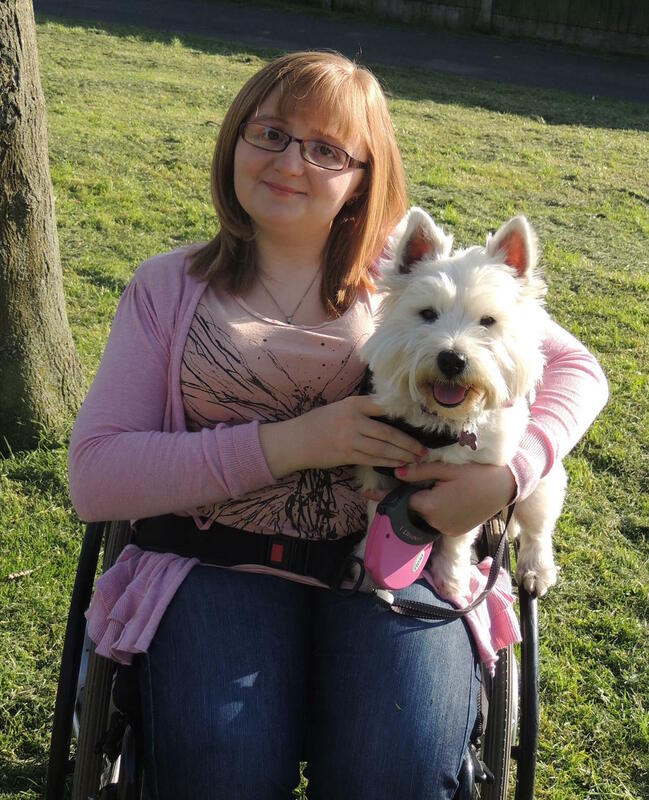 Especially as I am house bound at the moment I am having to rely on mum for dog walking duties and with my circumstances Lottie's walks are not as long as they were pre-operation.. So for us mental exercise is a top priority! 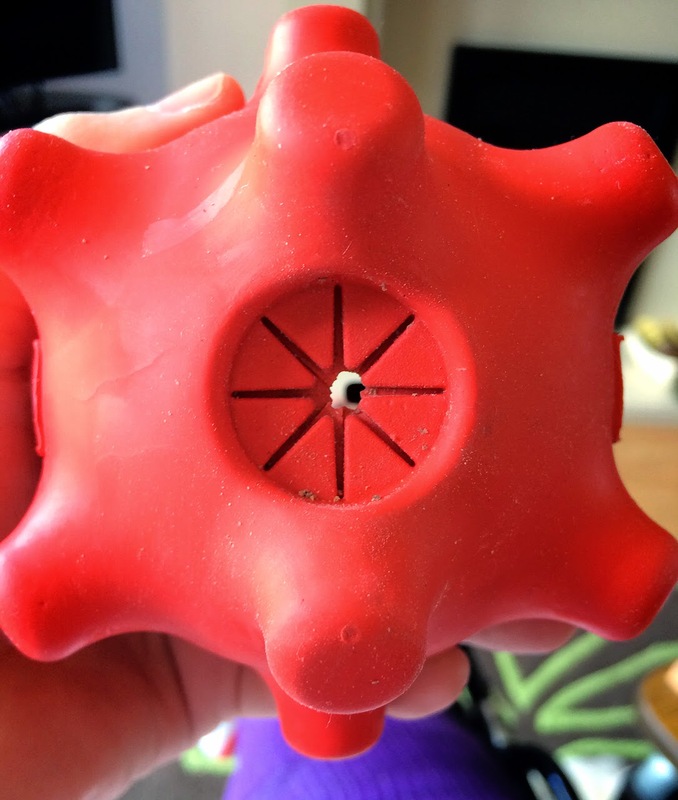 Does your dog like treat dispensing toys? Which ones do you find work the best? 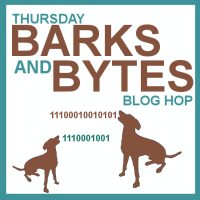 We are joining the Thursday Barks and Bytes Blog Hop Co-hosted by our friends at 2 Brown Dawgs blog and Heart Like a dog Grab the badge and join the fun!